One of three major foundations of traditional Chinese medicine, acupuncture is rooted in the principle that illness occurs when your qi (aka vital energy, internal life force, or action potential) which flows through your body’s meridian channels, or "energy highways,"—becomes blocked or imbalanced. Practiced for over 3,000 years, acupuncture safely employs the insertion of thin, sterile needles at specific points along those meridian channels or energy highways, thus affecting free-flow of qi, and ultimately, restoring a vibrant state of wholeness and balance. Acupuncture appointments typically run approximately 90 minutes for a first session, and 60 minutes for follow-ups, and can include other traditional Chinese medicine modalities such as cupping and moxabustion, as needed. Acupuncture heals health imbalances by clearing blocks along pathways known in TCM as “meridians.” You can think of these meridians like highways running all throughout the body. If there is a car accident along the "highway," car flow stops and piles up causing all kinds of problems and frustration, backing-up other exits. This congestion causes anger and irritability and can easily escalate to a boil (we’ve all been there). Then, the back up starts to cause congestion along other pathways and exits along the route, causing more trouble, congestion and pain. Acupuncture goes to the source of the problem and pile-up by dispersing the traffic clog and clearing up the congestion on-site. It provides alternate routes to get things flowing smoothly once again, so your body can heal itself and carry on to its next destination. Acupuncture is known to treat a variety of issues such as insomnia, colds and flu, dermatological conditions, aches and pains, cosmetic acupuncture for wrinkles (facial rejuvenation), digestive issues, anxiety, stress relief, allergies, addiction, sinusitis, infertility, and more. Anything you would go see your family doctor for is likely to be treatable with an acupuncture visit. Your diagnosis will BE made based on an individualized pattern tailored just for your needs. One of three major foundations of traditional Chinese medicine, herbal medicine uses organic materials—plants, sticks, twigs, rocks, berries, and more ingredients found in nature—as healing agents to support internal balance and promote optimal health. Whereas Western pharmaceuticals are processed by the liver; organic, food-based Chinese herbs are digested the same way our bodies digest food—delivering potent medicinal effects in a welcome, non-disruptive, and therapeutic way—without the harsh side effects of pharmaceuticals. In the teachings of traditional Chinese medicine, the "shen" or "sprit" shines on the face, opening up like a window to the soul. It's the ultimate example that true beauty starts from within. In a world of Botox, traditional Chinese medicine-based facial rejuvenation takes a holistic, non-surgical approach to restore your skin’s elasticity and youthful glow, from the inside out. 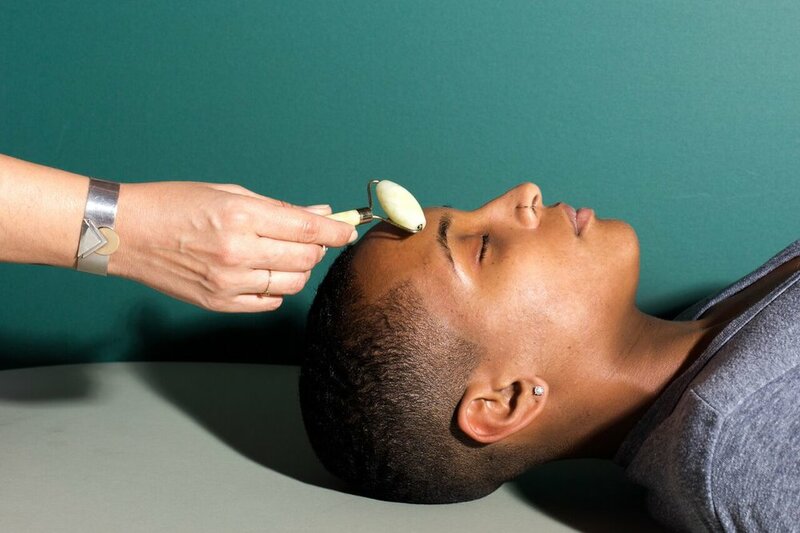 Using the REMIX by Giselle Wasfie essential-oil-based beauty line, local and distal acupuncture points, plus jade rolling (see here), this "natural facelift" fills in fine lines, treats age spots, and restores a radiant complexion that's nourished, toned and fresh. A jade rolling session normal occurs at the end of a facial rejuvenation treatment and uses the cooling and healing power of the jade stone to reduce swelling and puffiness, smooth fine lines, and reduce any inflammation or redness on the face. Jade rolling is highly relaxing, gentle and also therapeutic for opening up sinus congestion, increasing skin circulation, improving skin elasticity and giving the skin a fresh, radiant glow. One of three major foundations of traditional Chinese medicine, Eastern Nutrition focuses on the thermal properties and flavors of food; as opposed to Western Nutrition's focus on a food’s material makeup. Energetically classified as hot, warm, cool or cold, and sweet, pungent, salty, sour or bitter, in Eastern Nutrition practices, food (and its energetic components) affects every unique body differently and is used as medicine. Beyond your constitutional needs, an individualized Eastern Nutrition consultation will take into consideration how your body reacts to your environment, and by delving into your current eating patterns, ultimately inform you which classifications of foods you should consume to balance yin and yang energy and restore your body's natural digestive vitality. Moxa (or moxabustion) involves the burning of mugwort, or artemesia vulgaris, to strengthen the immune system, warm the body, and increase circulation of blood and qi. Used in tandem with acupuncture for over three thousand years, moxa therapy involves hovering a stick of mugwort over the body at specific meridian points to warm energy and open up the flow of those channels to allow for optimum qi flow and radiant health. Similar to burning sage or palo santo, moxa's scent is also known to be relaxing and soothing to the spirit. During the practice of cupping, suction cups are placed upside down on your skin, creating mini vacuums that draw out toxins and free stagnant energy. Cupping therapy (placed on by a fire source or a pneumatic pump) reduces pain and inflammation and restores blood flow to the local area, thus easing contracted muscles, freeing up tension and congestion, and providing relaxation and internal yin-yang balance among the meridians. A Japanese "laying on hands" technique, Reiki is based on the practitioner's vibration and intuition with balancing a client's "life force energy" (aka "ki" or "qi") and clearing chakras, reducing stress and promoting relaxation through touch, or, simply by hovering over the patient's body at different points.